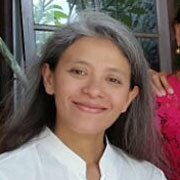 Sanur Weekly is the leading advertising magazine for Sanur. Printed in black and white only, we offer a fast, affordable and efficient advertising platform for commercial and private customers. Based on our statistics we reach around 10.000 to 12.000 readers per month with our printed edition and another 2.000 to 3.000 readers with our online edition. Our readership consist of 50% expats and locals and 50% tourists. 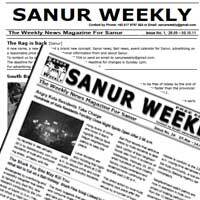 The printed edition of the Sanur Weekly is available for free &commat; more than 150 locations in and around Sanur. As a replacement for the already deceased "Sanur Rag" a brand new advertising magazine for Sanur was born. Started as a small project without any licensing we created and printed our first ever edition. With 16 pages, a hand full of advertising clients and only 100 printed copies we started to take over the advertising market in Sanur. Within less than 6 months the new born magazine grew up and became a teenage magazine. With improved layout and now with an average page count of 40 the magazine became more and more popular with the Sanur expat community and was also recognized by more and more tourists. 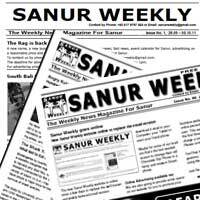 The first Sanur Weekly website went online providing a weekly download option to our readers. Sanurweekly.com became popular very fast and since these days we have readers and visitors from all over the world. The magazine went up to around 50 pages per edition and of course we did more and more printed copies. To serve the growing demand we increased the number of printed copies a few times troughout the year. New members joined the team to deal with the increasing workload for administration and logistics. More customers started to advertise with us and our website got the first update since the beginning for better readability on mobile devices. 300+ advertising customers in Sanur, 150+ distribution points and 1000 copies with around 60 pages per week. That counts up to 60.000 printed pages every week. A brand new logo and a brand new website are just a few of the whole bunch of changes we are planning for this year. Stay tuned for more new features. Did you miss the printed edition of the Sanur Weekly this week? To lazy to go out and grab one? Do you want to re-read any of the past editions? OK... No problem. 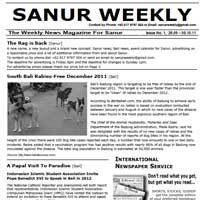 Download the latest edition of the Sanur Weekly or any of the previous ones since the beginning of time. So, How And How Much? To get our Sanur Weekly advertiser information package just enter your email address in the form below. You will receive an email with an attached PDF file including all important information like deadlines, prices and sizes, links to template files, limitations and rules, contact data and anything you should know when advertising with us. For special requests please use our contact form below. 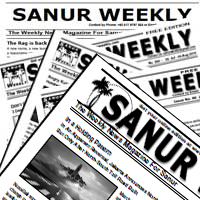 Please note: after requesting the Sanur Weekly advertiser information package it can take a few minutes for the email to arrive in your inbox. Please do not perform multiple requests in a short time. Our amazing and experienced team will provide you with the highest level of customer care. Do you want to receive a weekly reminder message when the new online edition is available? 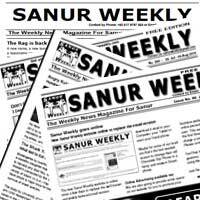 Just subscribe to our mailing list and you will get an email as soon as the latest Sanur Weekly Online Edition is available. Sanur Weekly is using MailChimp to run our mailing list. To unsubscribe from our mailing list simply click the unsubscribe link on the bottom of every reminder email. To get in touch with us just use the form below to send us a message. We will reply to all messages as soon as possible. We don't store any personal information on our server unless required for the on-going operation of one of our services. 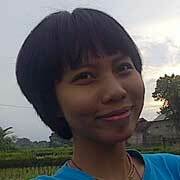 Information you provide - Sanur Weekly collects personal information (e.g. 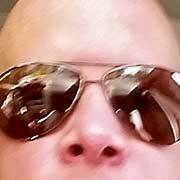 name, email, and IP address) when you use our contact form or otherwise voluntarily provide such information. Log information - Sanur Weekly automatically records information when you visit our website, including the URL, IP address, your internet provider, the date and time of your request and cookies that may uniquely identify your browser. User communications - When you send email or other communications to Sanur Weekly, we retain those communications in order to process inquires, respond to your requests and/or to improve our services. Sanur Weekly uses collected information for the following general purposes (but not limited to): products and service provisioning, billing, identification and authentication, service improvement, contact and research. Sanur Weekly may disclose personally identifiable information under special circumstances, such as (but not limited to) to comply with subpoenas, or when your actions violate the Terms of Service. We've taken industry-accepted measures to protect against unauthorized access, unauthorized alteration, disclosure, or destruction of data. These include the use of encryption technology when collecting, transmitting, and storing sensitive data. Sanur Weekly is not responsible for any damage, data loss or virus infection on your computer, handphone or whatever device you use, caused by the files provided for download on this page. Please make sure to have an up to date Anti Virus Program installed on your device before downloading files from our website. Any file has been scanned for virus infections on our computers but we can not give any guarantee that the files are completely free of viruses. Throughout our site we provide links to external websites. 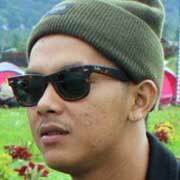 Although we make every possibele effort to ensure these links are accurate, up to date and relevant, Sanur Weekly can not take any kind of responsibility for the content of pages maintained by our clients, external providers or whoever.